This travel trailer is perfect for a couple or for a small family. You will enjoy your own private bedroom with a queen bed and your guests can sleep on the sofa or u-shaped dinette once folded down for the night. This unit includes an outdoor camp kitchen and a removable resin outdoor table that can go in front of the dinette inside or let it be the kids table outside. The rear living area is open and inviting thanks to the slide out and the full bath features a shower skylight and a shower with a seat. 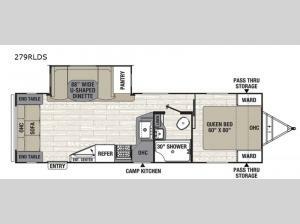 This unit also includes a pantry for your dry goods and an entertainment center with an LED TV!